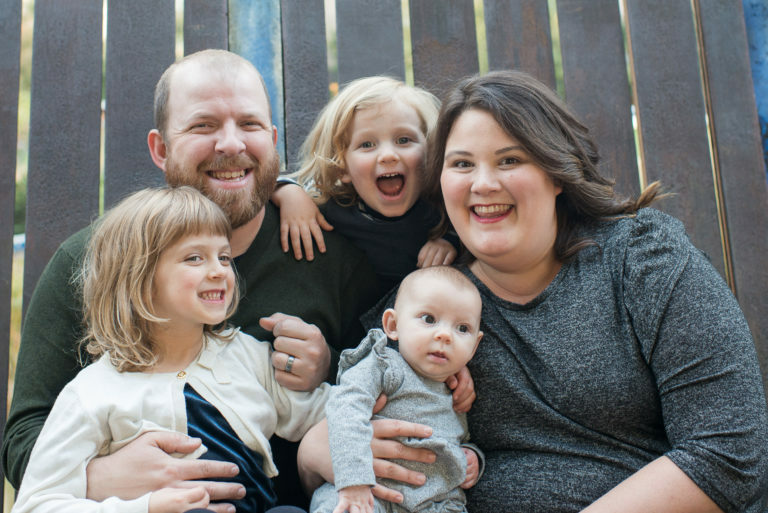 Disclaimer: We received a Happiest Toddler Package in exchange for this review and giveaway. As always all opinions are our own. On a whole I try to make as much of Edith’s snacks and meals but some days it just doesn’t happen and that is when I am thankful for brands like Happy Family. We started out with Happy Baby squeeze packets when Edith was around 7 months and since then we have tried a number of their products. I say we because I have eaten or at least tasted most of them as well. Now that Edith is a toddler and we are constantly on the go I ALWAYS have to have some sort of snack in my bag for her and while I often prefer whole fruits and things those get pretty nasty when you forget them in your bag so Happy Family to the rescue. Our favorites are the Happy Tot Coconut, the berry favor is our favorite (yes mine too!). We recently tried the Happy Tot Toddler Cookies and well they are a new family favorite- seriously yummy! You can find numerous Nutritional Resources, guides and charts for Happy Family Brands here. 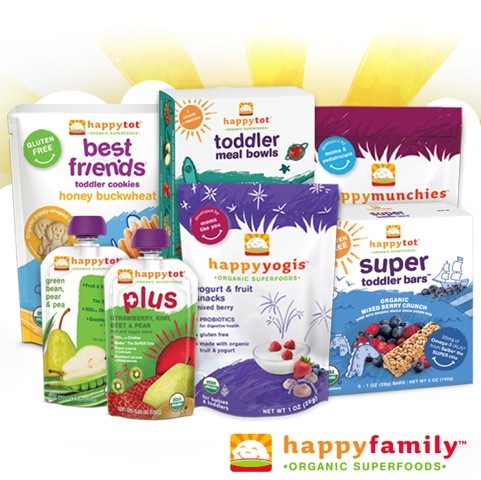 You can also visit their website at www.happyfamilybrands.com to learn more about the Happy Family Brand company and our their organic products. Giveaway: Open to US residents. We love the kale, apple mango pouches! I’d love to try any of the meal bowls. Sounds like a great option for rushed dinners. I haven’t seen a coconut squeeze pouch before, so we’d say the coconut mixed berry squeeze pouch! The honey buckwheat crackers sound good! We have gotten a few Happy Tot pouches before! I think my son would also love the carrot, mango and orange creamies. Well, my 10-month-old daughter already LOVES the Happy Puffs, so I’d like to try the Happy Munchies. She likes to crunch things, especially now that her 8th tooth has completed the top-bottom set! I’d love to get the Sweet Potato Puffs for my son. My kids love the yogurt food pouches the best. Yum! We’ve tried one or two of those and have liked them. Thanks!! 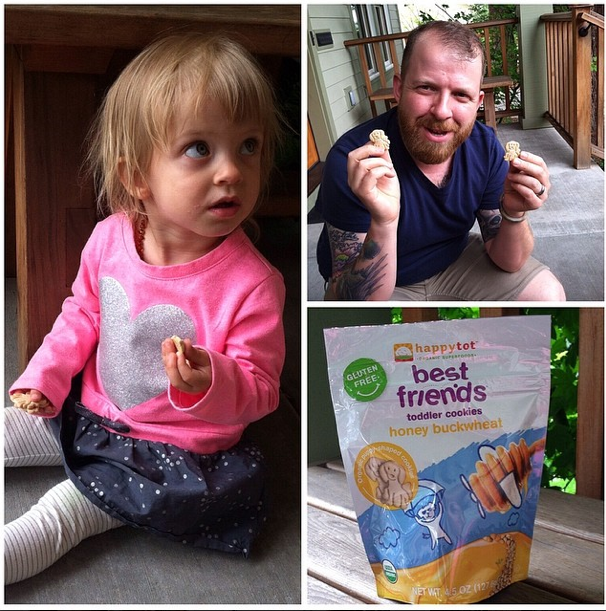 We’re big fans of Happy Family products in our house, but our little girl hasn’t tried the best friends toddler cookies. She’d probably love the chocolate pumpkin! 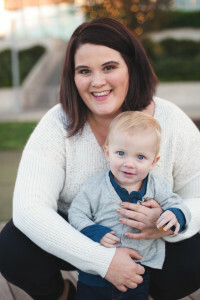 I can’t wait for my little one to try the super toddler bars! YUM!